Phil Jackson Ford Jr. born February 9, 1956 in Kannapolis, North Carolina; the son of two school teachers, Mrs. Mabel Ford and Mr. Phil Ford Sr. both whom were instructors in the North Carolina Public School system. Ford grew up in Rocky Mount, North Carolina and attended Rocky Mount Senior High School where he was honored with a position on the High School All-America team, before enrolling in the University of North Carolina under a full athletic scholarship under Coach Dean Smith. Ford was Smith’s first freshman player that was not on the junior varsity team to start a game during the coach’s tenure at UNC. Ford finished with a brilliant freshman year, leading the Tar Heels to the 1975 ACC Tournament championship; becoming the first freshman in league history to win the Everett Case Award as the Most Valuable Player in the ACC Tournament. After Phil’s sophomore season, he went on to earn a gold medal in the 1976 Summer Olympic Games in Montreal, Canada where Team USA included five other Tar Heels Walter Davis, Mitch Kupchak, Tom LaGarde, assistant coach Bill Guthridge and of course the brains behind all this talent, Dean Smith sailed passed the competition. Phil’s senior year proved to be his most rewarding season by far, winning the prestigious Wooden Award and averaging over 20 points per game. At one point, Phil led as both all time leading scorer at UNC with 2,290 points; and assists with just over 750. He was the second overall pick in the 1978 NBA Draft, selected by the Kansas City Kings. Ford continued to shine at the professional level, gaining the Rookie of the Year award in 1979. 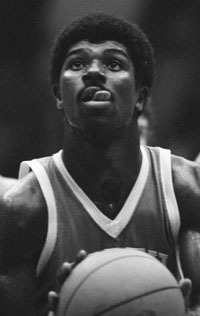 Ford retired from the NBA in 1985, and shortly after began a career in banking with North Carolina National Bank before embarking a career in coaching at UNC. Phil is an outstanding member of the Saint John’s Missionary Baptist Church and founded the Phil Ford Foundation that fights premature obesity. Returned to the UNC Tar Heels in 1988, but this time as an assistant coach not a player, He helped lead the Tar Heels to Five Final-4’s and 5 ACC Championship appearances and One well deserved National Title in 1993. Phil was an assistant coach under Dean Smith until Smith’s retirement in 1997, both Phil and another assistant Bill Guthridge were the top two for the job. After all was said, Bill Guthridge was awarded the head coaching job but Phil could not have been more happy for Bill. In the 1999-2000 season, Phil along with Head Coach Bill Guthridge and staff left the UNC Tar Heels. Newly hired head coach Matt Doherty brought in a whole new coaching staff and wiped the bench clean of veteran coaches. Phil did something that most coaches would not do, he helped new head coach Matt Doherty and gave him the in’s and out of the team. Phil had a short career in the National Basketball Association as an assistant coach for the New York Knicks under Isiah Thomas and then held the same position for the Charlotte Bobcats under head coach Larry Brown until 2008 when Ford retired from coaching basketball.